For example, tape libraries are suitable for data backup due to the associated slow access times, but higher write speeds. 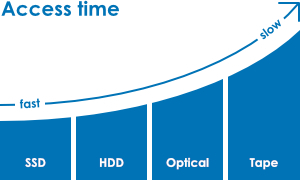 Optical libraries, thanks to their high durability and immutability (trueWORM) and lower TCO compared to hard-drive systems, are ideally suited for long-term archiving. However, when it comes to quick access by several clients to modifiable data, RAID systems with hard drives or solid state drives (SSDs) are the first choice. With its high performance, flash memories are increasingly the front end of choice on the memory landscape. Flash technology and flash storage is the future in this market segment. We are keen for the best technology to be used for each individual request; both from an economic and from an ecological perspective. We are happy to share our experience with you. Click here to find out more about the principles. If you would like to find out more, the INCOM team is always at your disposal. "Online storage" refers to the directly available memory. This includes flash memory and hard drive systems: Solid State Drive (SSD), RAID and NAS systems. These memories are either connected directly to the server or are available as standalone components via a network. The main advantages of online storage systems are the high access speed and, depending on the security architecture, high availability. For regularly used and changing data, these storage systems are indispensable. The disadvantage of hard drives are, on the one hand, the lifespan and, on the other, the power consumption, because the drives are generally always active. The higher the security requirements (RAID level), the more hard drives (or SSDs) are needed to counteract potential data loss through the loss of a hard disk. At each further RAID level, more hard drives are required, whereby the power consumption rises sharply, not only for the storage systems themselves, but also for the air conditioning required. "Nearline" means storage systems, in which the data is stored on removable media, and access requests are controlled via a storage management system or via backup software. However, the requested data is automatically made available to the user with the time delay due to the exchange process. There are a variety of approaches, which vary greatly in terms of capacity, access speed and durability. 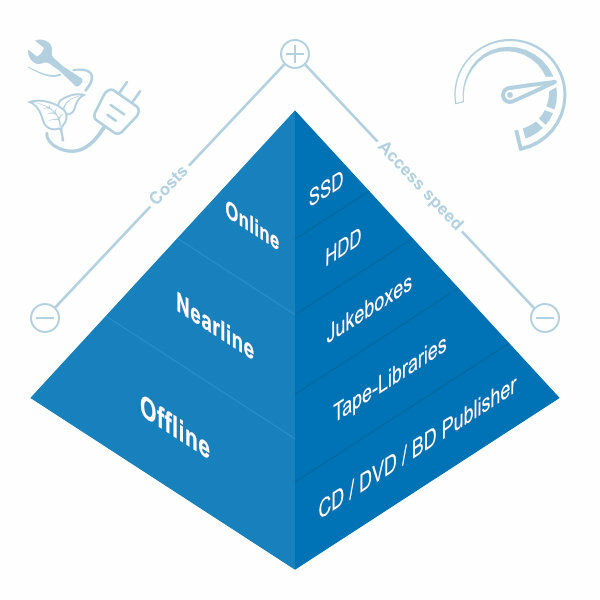 Whilst tape libraries are primarily suitable for backing up large data volumes which do not require random access, optical libraries are characterised by the long durability of the media and the direct access to all data on a given medium. Optical media are also ideally suited for long-term archiving, due to their immutability (trueWorm) and data security With really fast nearline access times, the data carriers consume very little energy in relation to their archive capacity, as confirmed by the TÜV [German Technical Inspection Association] in 2008. The total cost of ownership and low operating costs make it first choice for long-term data storage. Many business processes are subject to statutory retention obligations. Some of the data must be accessible; other data such as that concerned with product liability, where the complete documentation of the development and production process is required, needs to be stored only for a certain period of time. Often this archived data is destroyed after 10 years, without having been viewed. Depending on data volumes, the storage of data in online or nearline memories is unnecessary and, not least, much too expensive. INCOM offers, in the form of CD, DVD, or Blu-ray production systems, in conjunction with specialised offline archiving software, the option of moving this data to create backup copies and, importantly, the option of also feeding this data back into the production system automatically when it is needed. The data is written to data carriers and then uniquely labelled. Depending on the software solution, the system constructs a standalone database in which you can find the desired data and assign the data carriers. If you value independence, the media can be read without additional software on every optical drive using industry standards. 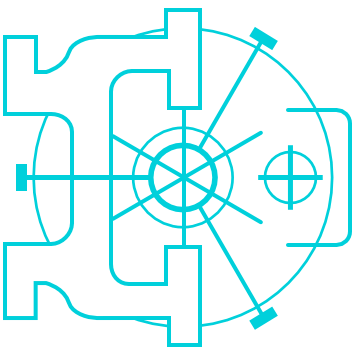 If the data is subject to safety regulations, the archived data can also be written encrypted, so that the archived information is protected against unauthorized access. Storage systems can be virtualised via storage controllers and bridges, and can be integrated into Storage Area Networks (SANs). While in the case of Network Attached Storage (NAS) systems, the data stored there can be accessed at network speed, SAN storage systems offer an access speed similar to that of local devices. If you have questions regarding storage systems do not hesitate to contact us.